K2 Learning Resources (India) Pvt Ltd, a hybrid (online + offline) education startup, has raised Rs 8 crore ($1.3 million) in angel funding from Radheshyam Agarwal, founder and director of Calcutta Tube India, in his personal capacity. This is the first funding for the startup and it will primarily be utilised for content development, acquisitions (to increase reach and bring resources in terms of manpower at lower cost) and setting up 'Tab Labs'. The startup plans to set up Tab Labs in over 100 colleges in the country, wherein, it would provide the colleges with specialised tablets with pre-loaded data relevant to any commerce student like online classes, chapters in a simplified manner, games and activities (relevant to the subject), etc. "We have spent enough time, energy and money in developing content in various formats. We are also in the process of setting up Tab Labs for the coming academic year and should be working with about 100 colleges for the academic year 2014-15," said Sripal Jain, founder and CEO, K2 Learning. The Bangalore-based startup was founded by Jain in 2010. A chartered accountant, Jain has close to four years of experience in the coaching sector. He has also authored titles of CPT books, which are published by Pearson. The company primarily focuses on commerce education and provides classes for courses like CA, CS, CWA, PUC and B.Com, etc. All courses are delivered in a number of formats that include online, physical coaching (at present the company has three centres), on tablets and through books & test series, among others. "As we are a training institute, we also develop, review and upgrade a lot of in-house content relevant to the subject. We have a dedicated team which makes sure the content is not only as per guiding rules of PU board, but is also creative so as to reach out to our clients and students," he added. 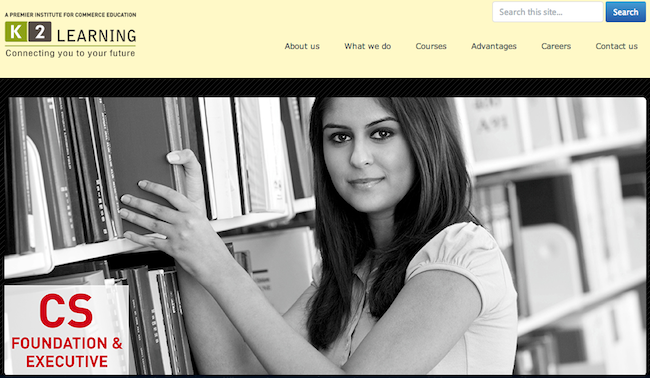 According to the site, the company has trained over 3,000 students till date. Jan 2013: Education-focused private equity firm Kaizen partnered with German media major Bertelsmann to invest Rs 22 crore in online education firm AuthorGen Technologies Pvt Ltd, a subsidiary of the listed education major Educomp Solutions Ltd.
Feb 2013: Info Edge (India) Ltd infused an additional Rs 30 crore ($5.5 million) in Applect Learning Systems, which runs an online education and assessment venture through Meritnation. May 2013: eDreams Edusoft Pvt Ltd, a Bangalore-based technology product startup focused on the education industry, raised $2 million in its second round of funding, led by Inventus Capital Partners. Existing investor Mumbai Angels also participated in the round. May 2013: Delhi-based Earth Education Valley Pvt Ltd, which owns and operates the online education platform EduKart.com, raised $500,000 in seed funding from a group of early-stage institutional and angel investors. These include French early-stage fund Kima Ventures, Amit and Arihant Patni (from Patni family), computer services firm AKM Systems, Vibhor Mehra (ex-partner at SAIF Partners) and Stanford University alumni, among others. Sept 2013: Bangalore-based Simplilearn Solutions Pvt Ltd, the company that owns and operates Simplilearn.com, an online education and training destination for professional certification courses,secured $10 million in a Series B round of funding from Helion Venture Partners and existing investor Kalaari Capital.